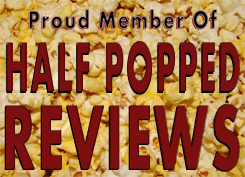 I don’t say this often, but some films really get on my nerves…but kind of in a good way. These movies are done with such precision that you get so transfixed with what’s going on that it makes you cringe with slight disgust but leaves you with unquenchable curiosity for what’s coming next. Nightcrawler had me on the edge of my seat, and for a type of movie that doesn’t normally have me interested, I was hooked in more ways than I’m having difficulty explaining. If you are unsure about watching it like I was, you need to at least give it a chance, because there’s nothing like it out there. 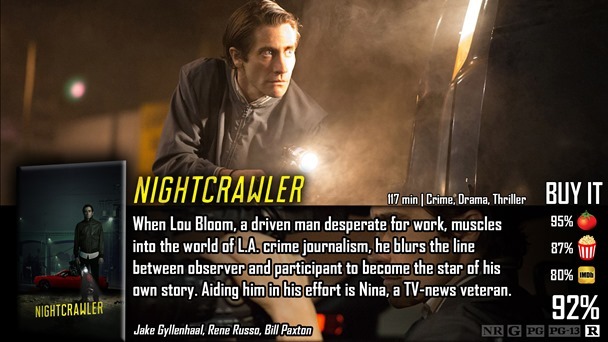 Nightcrawler stars a creepily thin Jake Gyllenhaal with an equally creepy persona as Louis Bloom, a man that really needs a job. That is, until he discovers what it is like to be a nightcrawler, a freelance journalist that films crime scenes before the police arrive to sell to the News. However, his insatiable apatite for money and perfection finds him on and over the line of ethics and morals, as he films the crime scenes as he deems fit – which means breaking and entering, tampering with the evidence, and much more just to get that perfect shot. This movie is, well, it’s kind of insane. If it weren’t for Gyllenhaal, this movie wouldn’t really be much of anything. You see, he not only looks creepy, he walks and talks creepy as well. Throughout the film, you know there is something very wrong with him, but it never really explains what that is – which is perfect. It keeps you guessing and you never know what will happen next. My best guess was sociopath with homicidal tendencies, but again, that’s just a guess. He could just be a weirdo. The fact of the matter is, Jake Gyllenhaal continually kills it in the movies. He’s a god at acting. My stomach was slowly churning throughout the movie for a few reasons. Few movies have the ability to keep my attention so thoroughly, and Nightcrawler kept me insanely zoned in. What was happening wasn’t only unnerving and original, but in a certain light it was pretty believable too. The videos he illegally obtains are blared on the News like any other story, and it really makes you think how often this actually happens. It’s told as-matter-of-factly, but the reality of the situation is really tense and really messed up. You think paparazzi is bad? Try crime journalism. It seems to me that this film was equally balanced in its character development, acting, story progression, and editing in order to make the entire film have an unnerving tone to it that never once goes away. Need to use the restroom? Use it beforehand, because even with the ability to pause a movie – you wouldn’t dare disrupt the pacing this movie had for itself. It’s definitely a winner, even if it doesn’t win that Oscar later this month. This is one of the very few movies I’ve ever seen that had me on the edge of my seat and had me clinging my upset stomach. The world is messed up, and the hunger of television and numbers, and what people are willing to do to achieve them makes my head hurt. This is original, thought-provoking, and chilling. You have to watch it. It’s not really a typical movie in terms of protagonist, antagonists, and a typical plot arch. That’s because it’s a dark, brooding movie that is made to dig deep into where you’re uncomfortable…and some people just don’t like that. A very creepy movie, if especially for Gyllenhaal’s performance. Good review Dave.